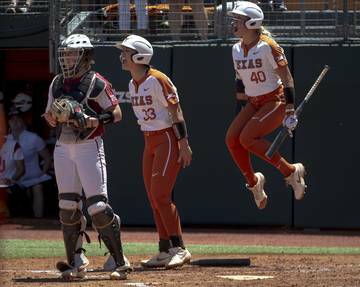 On Sunday, Texas found just enough pitching and offense to claim a victory in its conference-opening series with Texas Tech. 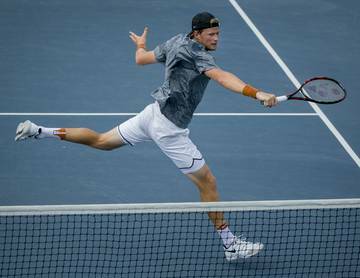 Held without a hit over the final seven innings of a 3-0 loss on Saturday, Texas was no-hit by Leander native Mason Montgomery over the first five frames of Sunday’s finale. Austin Todd and Eric Kennedy, though, led off the sixth inning with singles. 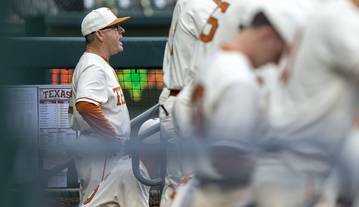 Masen Hibbeler drove in both of his teammates with a two-out single, and Texas later took a 3-1 lead when an errant throw on a double steal allowed Hibbeler to score. Hibbeler, who entered the game with a .207 batting average, also drove in a run in the eighth inning. That run-producing single ended up being the difference since Texas Tech’s Josh Jung made it a 4-3 game in the ninth inning with a two-run homer. 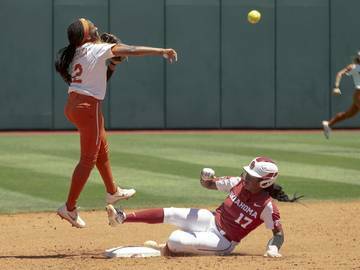 After using only five arms over the first two games of this series, Texas had seven pitchers surrender three runs, eight hits and nine walks on Sunday. Eight Red Raiders were stranded in scoring position. 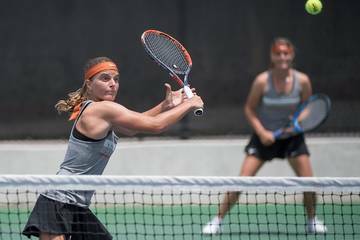 The Big 12’s regular-season champion in 2018, Texas (15-7) improved to 2-1 in conference play. 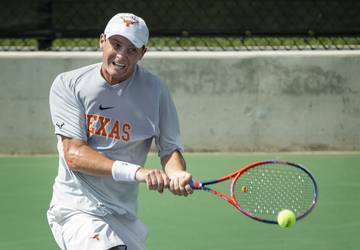 UT also beat Texas Tech 4-3 on Friday. Texas Tech’s overall record dropped to 12-5 after Sunday’s loss. Texas Tech had a chance at an early run when Tanner O’Tremba doubled in the second inning with a teammate at first base. 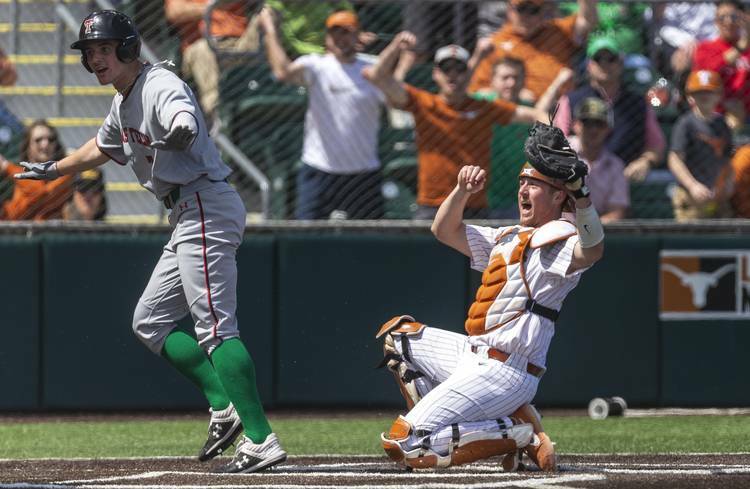 The Longhorns, though, kept the Red Raiders off the scoreboard as Hibbeler, the UT shortstop, successfully relayed a throw from Kennedy in left field to catcher Michael McCann. The out call was reviewed and upheld. The defensive assist was the first of Kennedy’s collegiate career. Fellow starting outfielders Duke Ellis and Todd have combined to thrown out three runners this year. Todd, Hibbeler and current UT first baseman Tate Shaw were responsible for all 11 of last year’s outfield assists. NOTABLE NUMBER: 57. Texas has now played 57 games on St. Patrick’s Day. 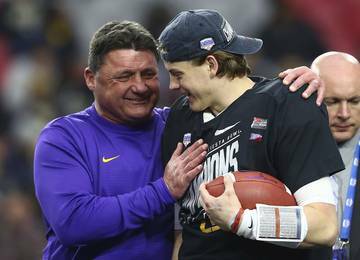 The Longhorns are 40-15-2 in those contests. 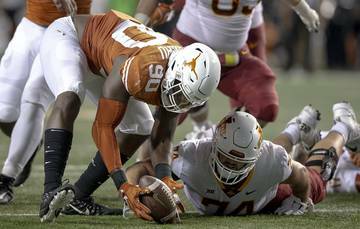 The first time that Texas appeared on March 17 was in 1898, and the Longhorns recorded a 20-5 win over St. Edwards on that day. Every year from 1931-33, Texas was dealt defeats on St. Patrick’s Day by either the Chicago White Sox and Detroit Tigers. UP NEXT: Arkansas will be in town for two intriguing non-conference showdowns on Tuesday and Wednesday. 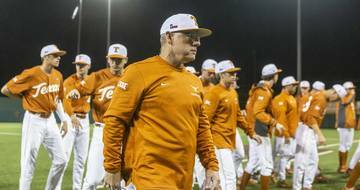 Texas and Arkansas were ranked 12th and 14th in the D1Baseball poll this week. Last year, the Razorbacks beat UT three times by a combined score of 31-14. The last meeting — an 11-5 Arkansas win — was staged in the College World Series.